A Fine Gael TD has been criticised for raising the possibility of funding the repatriation of unemployed foreign nationals. 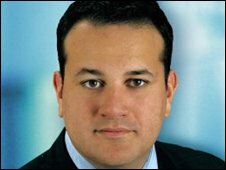 Leo Varadkar, spokesman on Enterprise, Trade and Employment, made the call at a sitting of the Oireachtas enterprise committee in Dublin on Thursday. On Wednesday unemployment figures for the Republic reached a 10-year high. Mr Varadkar suggested it might make sense to pay unemployed migrants to leave the country. "Would there be a case at this stage for giving an offer to foreign nationals the opportunity to receive say three or four or six months of benefits, if they then agreed to repatriate to their country of origin and then forego benefits beyond that?" he said. While Mr Varadkar stressed that such a move would be voluntary and was not a proposal, the idea was described as "a new low" by Fianna Fail TD Thomas Byrne. "Politics in this country has reached a new low when Fine Gael are suggesting a voluntary repatriation scheme," said Mr Byrne. "I think Deputy Varadkar should withdraw his proposal because it is in the dishonourable tradition of the British National Party." It was also criticised by training agency FAS. Its Director General Rody Molloy said that the system would be difficult to police and that EU nationals should enjoy the same rights Irish people elsewhere in Europe. Similar moves are already being introduced this month by the Spanish government, which is planning to offer unemployed immigrants lump-sum benefit payments - typically worth around 18,000 euros (£14,200) - if they volunteer to go back to their home countries and not return to Spain for three years.